The 2018 Fall Klamath Bird newsletter is out! This edition looks at new ways KBO’s science is being applied in the world … also new Words on the Wind and Bird Bio features. Look! Come see it all in the 2018 Fall Klamath Bird! Printed newsletters are in the mail to subscribers … CLICK HERE to view the Klamath Bird Fall 2018 edition (web) version. CLICK HERE to download the Klamath Bird Fall 2018 edition (print) version. CLICK HERE to view all past Klamath Bird editions. Enjoy! Klamath Bird Observatory’s Wings and Wine Gala is back by popular demand. Come celebrate more than 20 years of KBO advancing bird and habitat conservation through science, education, and partnerships. Please help us continue our work by participating in this fundraiser. As a World Migratory Bird Day event our Gala will celebrate The Year of the Bird. Join us as part of a global conservation community that appreciates the wonder of our feathered friends and works together to protect birds. Our Gala will feature field trips, heavy hors d’oeuvres, local wine and beer, silent and live auctions, an art gallery, live music and dancing, and an opportunity to convene with our KBO community. A good time will be had by all. MORE INFORMATION ABOUT THIS EVENT COMING SOON! The late-Winter Special Edition Klamath Bird newsletter is out! It’s a close look at KBO’s Community and Professional Education programming. This edition ranges from Klamath Basin birding to migration research in Nayarit, colleagues and partners from Brazil to Ethiopia to New Zealand, and back around to tell our collected education story. There’s also a new Bird Bio and Words on the Wind feature—we hope you enjoy! CLICK HERE to download the Klamath Bird late-Winter 2018 Special Edition. If you subscribe to a print copy it is in the mail. Thanks! Why Noah Strycker? Why the Monument? Why conservation stamps? New York Times bestselling author (and birding superstar), Oregon’s own Noah Strycker, is coming to Ashland on September 23rd to help Klamath Bird Observatory and our community celebrate our love for birds and birding and to help support Klamath Bird Observatory’s science-driven conservation efforts. For more than 25 years we have been using birds as indicators of environmental well-being and the science of bird monitoring to advance ecosystem conservation in the Klamath-Siskiyou Bioregion of southern Oregon and northern California. During that same time birdwatching has become the fastest growing recreational activity in the United States — birders have been fueling local economies spending $13 billion annually in pursuit of this fascinating hobby, while raising attention to the importance of birds and bird conservation to human, economic, and environmental well-being. Noah will keynote our September 23rd Mountain bird Conservation Fundraiser at the Historic Ashland Armory. 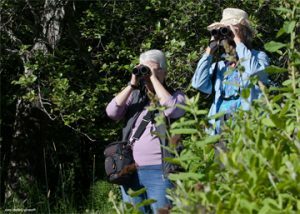 This “conservation birding” event will feature Klamath Bird Observatory’s science and conservation in the Cascade-Siskiyou National Monument. Additionally we will unveil our 2017 Conservation Science Stamp, which all attendees will receive along with a 2017-2018 Federal Migratory Bird Hunting and Conservation Stamp. Why Noah Strycker? Klamath Bird Observatory President Shannon Rio explains — In 2015, bird nerd Noah Strycker became the first human to see more than half of the planet’s bird species in a single year. I am inspired by Noah’s story and I think you will be too. During Noah’s round-the-world birding trip he was scourged by blood-sucking leeches; he suffered fevers and sleep deprivation; he survived airline snafus, car breakdowns, mudslides, and torrential floods; he skirted war zones; and he had the time of his life. Birding on seven continents and carrying only a pack on his back, Strycker enlisted the enthusiastic support of local birders to help him see more than 6,000 species. By bringing Noah to our event we will be furthering Klamath Bird Observatory’s dedication to wildlife education, which is my personal passion. Our education connects people with birds, building in them a passion and love for birds with an intention to build a community that protects that which we love – birds. So please come hear Noah’s story and help us advance bird conservation through science, education, and partnerships. Why science and conservation in the Cascade Siskiyou National Monument? Klamath Bird Observatory Science Director Jaime Stephens explains — The Cascade-Siskiyou National Monument provides an example of how KBO’s science, when applied to decision making, has resulted in good things for birds and for the environment that we all depend on. The Monument, originally established in 2000 and expanded in 2017, is located at the crossroads of the Cascade, Klamath, and Siskiyou mountain ranges—the area has long been recognized for its unmatched biodiversity. KBO has worked with a team of scientists to inform management goals and the recent boundary expansion. Decisions informed by our science have led to further protection for species and habitats that our recent peer reviewed science identified as underrepresented on protected lands, including the imperiled Oregon Vesper Sparrow, a regional subspecies that spends its summers in the grassland habitats of the Monument. Why conservation stamps? Klamath Bird Observatory Executive Director John Alexander explains — Each year the price of our annual conservation birding event includes the purchase of a Conservation Stamp Set. The set includes the 2017-2018 Federal Migratory Bird Hunting and Conservation Stamp, known as the Duck Stamp, and Klamath Bird Observatory’s 2017 Bird Conservation Science Stamp. Why the Duck Stamp? Because we see birds and birding as our refuge, and by purchasing Duck Stamps birders can directly contributing to bird habitat conservation efforts on our National Wildlife Refuges; the United States refuge system is one of the world’s best migratory bird conservation models. Plus the Duck Stamp provides you access to our Nation’s refuges. Why KBO’s Conservation Science Stamp? Proceeds from the conservation science stamp support and bring attention and the science-based programs, such as our work in the Cascade-Siskiyou National Monument, and specific species we are working with. So please join us at our 2017 conservation birding event, the Mountain Bird Conservation Fundraiser, and put your stamp on conservation. Klamath Bird Observatory’s Mountain Bird Conservation Fundraiser is an International Bird Day Event. The International Bird Day theme, helping birds along the way, recognizes the importance of stopover sites and their habitats. In our region the Upper Klamath Basin serves as a critical staging area for migrating waterfowl, and throughout the Klamath-Siskiyou Bioregion riparian habitats along lakes, river, and streams provide important stopover habitat for migratory songbirds. By supporting Klamath Bird Observatory you support the science that drives conservation for migratory birds and their stopover habitats. The 2017 Winter Klamath Bird newsletter is hot off the presses! In this issue we look back at the year gone by and ahead to the one before us with Tales from the Field, the Olive-sided Flycatcher: a Bird in Trouble, Mountain Bird Festival news, Words on the Wind, Opening New Doors to Conservation, and more! Look! Come see it all in the 2017 Winter Klamath Bird! Print newsletters are in the mail to subscribers … click here to view the online edition. Our work depends on you! The fall has arrived and with it the southbound migration of many of our beautiful birds. As they journey to their wintering grounds we transition our attention from field to office; this is the time of year for review. As we reflect on the passage of our birds and interns, we look to their future as well. Our seasonal employees and interns scatter to new projects, new prospects, and vast distances to further the advancement, not only of themselves, but of the future of our natural world. With this parting the natural world around us becomes quieter; the birdsong of the spring and summer beginning a decrescendo. This modulation brings responsibility. A duty to safeguard the return of our birds, to ensure the robustness of our programs, to protect and scrutinize our data, and to deliver our science to ensure the decisions being made are informed and sustainable. We continue to develop and enrich our research with programs in long-term monitoring and applied ecology in the ruggedly beautiful Klamath-Siskiyou Bioregion and beyond. Though many of the birds we study summer and breed in our region, they winter in Mexico and Central America. We need to ensure these birds are not only protected here, but on their wintering grounds as well. To protect their full life-cycle we continue to invest in international interns each year. These interns, and the network of international migratory caretakers they create, are part of our legacy. Our relationship with these caretakers is further nurtured as we maintain our crucial partnerships abroad. When you contribute to KBO, you also become a caretaker. Your private dollars contribute to the science and outreach programs which support our migratory birds both here and abroad. You, our loyal members and donors, play a vital part in this change of seasons too; a role in the responsibility as stewards of our natural world. We look to you to contribute at this significant time of transition as the year winds to an end. For with this ending comes a bright beginning as we prepare for the year to come. In the coming year our programs, our science and our organization need your generosity. Your donation is crucial in helping the Klamath Bird Observatory advance bird and habitat conservation. We hope you will answer this call as we ask you to build on your role this year as caretakers of our shared birds; we are eternally thankful for it.. The 2014 Early Winter Newsletter has hit the shelves! The Klamath Bird Observatory staff and field biologists work hard throughout the summer months collecting data for KBO’s conservation science projects. This unique newsletter has the best of both worlds: scientific perspectives combined with thoughtful, personal reflections on the field season. Click here to view the entire 2014 Early Winter edition of the Klamath Bird Newsletter. 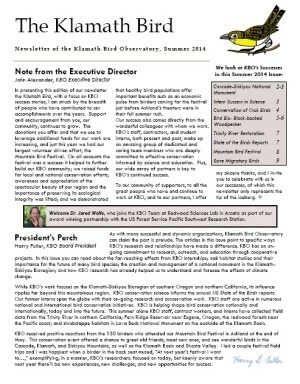 Click here to read an extended version this newsletter’s Note from the Executive Director, in which John Alexander celebrates Klamath Bird Observatory’s Natural History and Field Biology based foundation.